Mark Schaefer dubbed our never-ending content creation Content Shock. Marketers, colleagues and personal connections fill your devices with more and more messages. Each ping erodes your attention. They leave you drained. Get your content found and delivered in less time than alternative content options. Make your content accessible on the user’s device of choice. Think mobile first, not mobile only. A reliable source and generally free and ungated. Ensure your content is easy to consume, encourages readers to take action (namely email subscription and/or purchase), and gets them to share it. 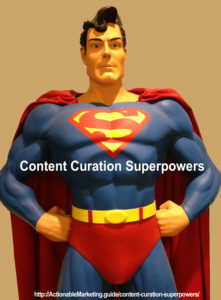 Fortunately, you can accomplish these 3 tactics by acquiring content curation superpowers. Even better, any business can do this. Use content curation to break through! Even if you could create enough content to keep up with demand, the reality is that you can’t shout me, me, me! No one will listen to you, not even your mother. To succeed, change your approach. Don’t force people to listen to your promotions and advertising! Instead, find them the information they’re actively seeking. Put it into an easy-to-find and consume format. Then they’ll seek you out for insight on a specific topic. Be selective. Highlight your most recent, relevant content mixed in with other people’s content, including your competitors. The prize goes to the person or brand that can cull through everything that’s flooding into our communication channels and select the useful, important gems based on an understanding your audience’s persona. 1. Determine your content curation topic. Your objective is to build authority on a topic related to your firm, brand or product. It must be aligned with your marketing and branding. Go beyond selling products. Be the go-to expert. Tap into your firm’s mission. Often this is broader than your focus on sales and profits. Don’t limit yourself to looking inside. Step into your audience’s shoes. What are their information needs. Be at the intersection of your business mission and your audience’s goals/needs. Set up listening posts. Turn the content spigots on slowly. You don’t want to be overwhelmed. Examine a variety of different conversations on your topic. Do Google searches and use BuzzSumo to assess the popularity. Also check major conferences in your field. Find out who’s speaking and what categories are covered. Tap into social media and sharing sites like Reddit and Twitter. Determine what the key conversations in your category are. Be an active listener. Where appropriate add useful commentary. Don’t mention your company or product. The objective isn’t to push your agenda or appear to be a troll. You want to find the best content gems. Build curation stations. Set up a set of places and systems for selecting and sharing the gems you find. Test the best content curation technologies and platforms for you. When you share curated content, you must add value for your audience with editorial selection, commentary and context regardless of where you distribute it. Social media. 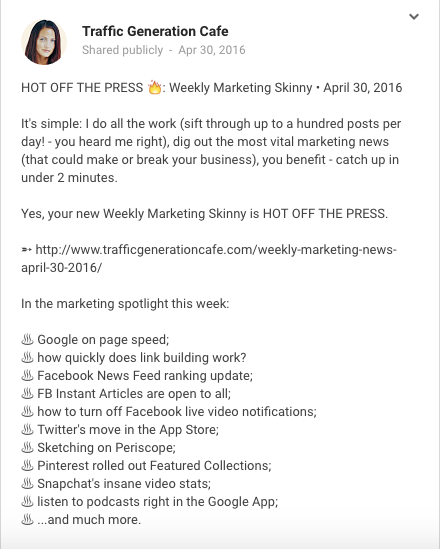 For example, Ana Hoffman curates weekly news on Google+. Third party media. For example, Robin Good curates content on Scoop.It. A key to being a content curation superstar is providing editorial selection and context that explains why the content is important. Editorial selection. Show your point of view, knowledge of the field and taste. Use your brand’s voice, vocabulary and insights to set your curated content apart from the masses. Incorporate your brand colors, graphics and typeface . Bottom line: Your audience must recognize the curated content as yours even if your name or logo aren’t visible. The Week, a print magazine, consists of curated content. Its editorial team spotlights key news. It also includes gossip, trivia and other general interest categories (Travel, Books, etc.) from other sources. Content curation extends the shelf life and reach of your existing information. These gems are known as evergreen. They tend to focus on recurring topics or holidays. To maximize your internal content, you must be able to retrieve it quickly and easily. Digital content asset management supports this effort. Content curation finds and gives new life to your existing information. Content Marketing Institute’s Joe Pulizzi hired Jodi Harris from within. Harris understood CMI’s content and brand. Perform a content audit across your organization. You never know what gems might be hiding, lost without any categorization. Determine which content can be utilized in new and existing content. Update it where appropriate. Support new content with related existing internal content. This requires good intelligent content to provide the best, relevant content. Schedule your evergreen content in editorial and social media calendars where appropriate. Don’t assume staff will remember to repost and share your event-related information when appropriate. Where appropriate, tap into other business’s events. This focuses on Other People’s Content. It helps you tap into audience interest in strong performing content and newsjacking. Select the best content. Your goal is to find the best stuff. You need to take care not to just choose articles from the top sites or writers. This tarnishes your brand. At the same time, build visibility with your key content creators. Comment and share their content. Package other people’s content. Provide context for the information and increase reach across platforms. 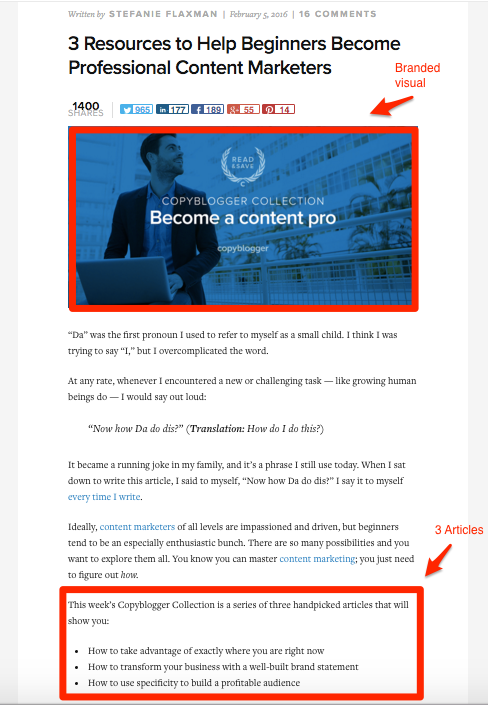 To set yourself apart, you want to help increase the bump of each piece of content you curate. This is a win-win. Your audience keeps coming back for more and you bring new readers to the content. Promote other people’s content across channels. Keep their content top of mind. 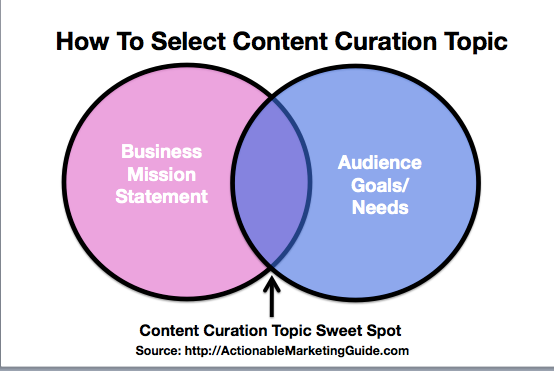 Content curation superpower comes from leveraging other people’s audience. What matters is how you take other people’s content and make it reach a bigger audience by spotlighting other content creators and make them look their best. Done well, content curation can act like egobait. You share other people’s content giving them full attribution. It attracts influencers to your curation and they share your stuff and broaden your reach. 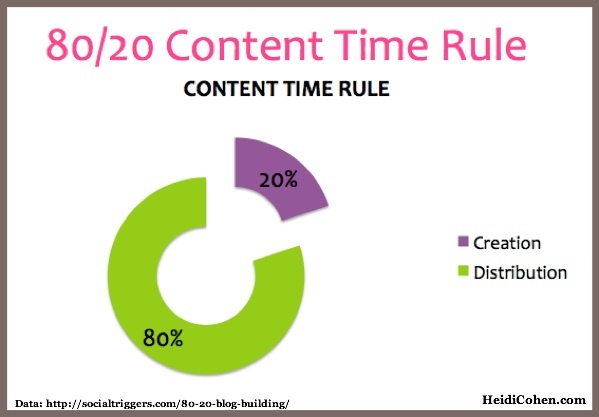 This is aligned with Social Triggers’ Derek Halpern’s 80-20 rule of content marketing: Allocate at least 4 times the effort to distributing your content as you do to producing it. Done well, content curation taps into other people’s communities. Mention content creators when you share their content. Adding attribution broadens your reach on social media. This applies to your own content as well. Create content curation by getting input from key influencers. Everyone loves seeing their name in print. Do the heavy lifting of content creation. Let contributors know the piece is live. This is a favorite way to create content as well as to involve influencers. 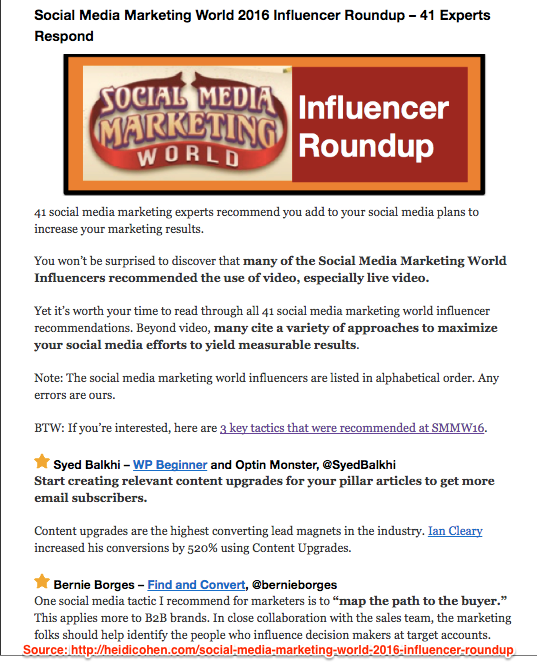 Here’s an example from Social Media Marketing World presenters. 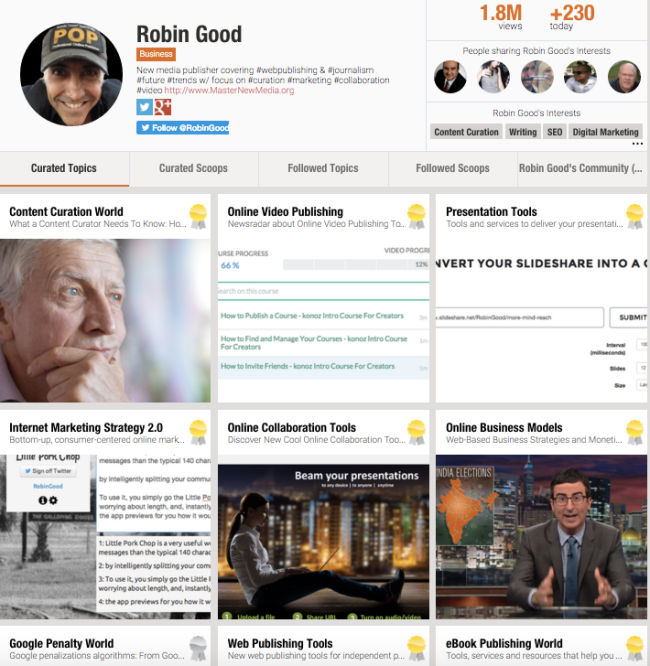 Contact people after you’ve shared or curated their content. Use an old fashioned email. Don’t expect them to share or comment on it. Content curation enables you to provide quality content to your audience without constantly shouting me, me, me! Use these 3 content curation superpowers to provide value to your audience. Select quality content, put it in context, and make it easy to find. This helps build your authority and your network by engaging with key thought leaders in your category. 7 Steps To Content Curation Success. The Superman logo is a registered trademark of DC Comics. Tags Ana Hoffman, Jodi Harris, Joe Pulizzi, Mark Schaefer, Robin Good, Scoop.It. Bookmark the permalink. I am using these techniques with great success! I’ve seen a bunch of articles on curation that gives me few new ideas for new things. These are indeed sensible ideas.Thanks for sharing this post with us, I really appreciate it! Wow glad I found your blog over at Entrepreneur! I just read through your post. Awesome content! Never really thought about content curation in this sense. I’m definitely going to apply some of your strategies because they obviously work! Thanks for this post Heidi. I know that content creation is something I need to look at in more detail. I think a lot of people are afraid of curation out of fear of being slapped down for having duplicate content – It is important that bloggers learn the difference between duplicate content and content curation. Definite fine line here, but as long as you add value in the form of commentary or additional information, seems to be fine from a user standpoint as well as from Google’s standpoint. But interested to hear others’ experiences on this!